All are Welcome...Come and Listen....for God’s guidance and experi- ence His loving forgiveness! 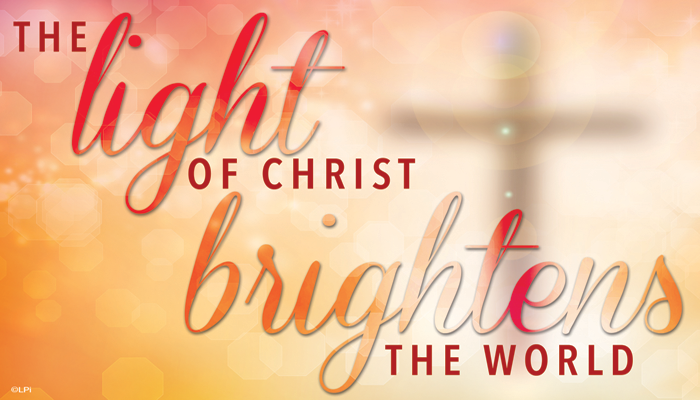 Easter Vigil Servers meet Saturday, April 20 at 11:00 AM. Please let family, friends, and neighbors who are home bound know that Holy Cross will be recording and live-streaming all Holy Week Masses/ Services on our website. Holy Cross has planned a 10:30 AM Mass on Easter Sunday in the School Gym. This celebration is family-oriented and thus might be ideal for families with small children. Any help you can give to prepare the Church for our Easter celebrations would be greatly appreciated. A crew will be gathering to do a major cleaning of our church. Come one, come all, male, female, young and old. Many hands make for light work. We need to get into the nooks and crannies of our church, clean out the cobwebs and make our church sparkle: our Holy Water Bowls need cleaning; railings & statues dusted; floors vacuumed and swept. There will be plenty to do, even if you can only help for half an hour or so. If you are available on this cleaning day, please consider coming to lend a hand. If you would be able to come, call the Parish Office (663-2244) and leave your name. (Drop-ins are always welcome as well!) We will have some cleaning supplies on hand, but if you can bring any, that is appreciated. If you wish to help but can’t come on the scheduled day, let us know and we will give you a job to do, at a time of your convenience. The Liturgy Committee invites anyone who would like to assist in decorating the church and school gym for Easter to join them. Many hands make the work light. There is a job for the young, old and in between, for families, singles, children and couples. We had a wonderful turnout for Christmas decorating and we hope for a repeat. Please call the Parish Office at 663-2244 if you plan to help. recreates the emotional aspects of the passion of Jesus through narrative, music, characterizations, silence, and the diminishing of candlelight as a symbol of the darkness and desertion that fell over Jesus in those final hours. The powerful narrative and moving portrayals truly take you into the story. Now in its 9th year, The Seven Last Words of Jesus is a very prayerful and inspiring way to conclude your Lenten journey. Recommended for teens and children over 10 years. Join us as we offer this wonderful Polish tradition that is also accepted in the Catholic Church. The food, brought in by parishioners who want to participate, is blessed on Holy Saturday, and then becomes part of their Easter Sunday meal. Traditionally, the main foods blessed are an egg which is broken and shared by all on Easter Sunday morning, and a lamb molded of butter or pastry. 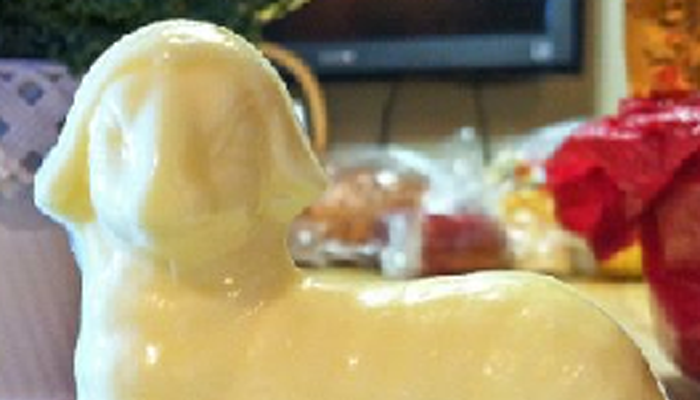 This butter-lamb and blessed Easter egg have a place of honor on the festive Easter table. You are encouraged to bring any food you plan on having at your Easter celebration to be blessed. All are welcome! Just a reminder that Saturday’s Easter Vigil on April 20 at 7:30 PM is not an ordinary liturgy. 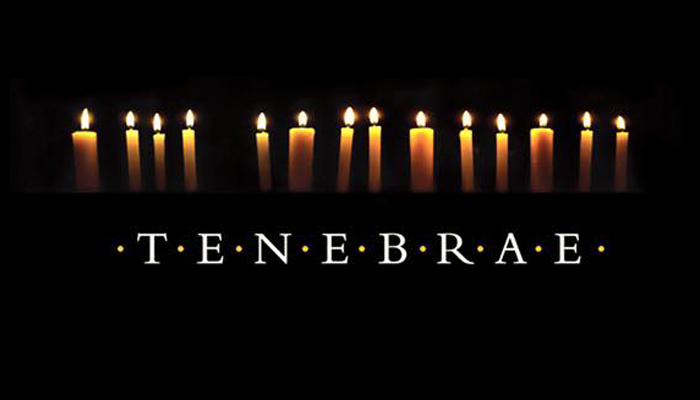 We assemble in dark-ness and bring into our midst the new fire of Easter. Candles are lit and we bask in the Light of Christ. Readings remind us of our journey of salvation. Easter Water is blessed. We welcome new members into our faith community and we sing our Alleluias. Indeed this is a different night and all Christians revel in the New Life that is ours. Because of these additional rituals, the Easter Vigil is longer. We invite you to join us because this is the best night of the year. The church pulls out all the stops and puts into the celebration the best of everything. When you are not here, our community is incomplete.